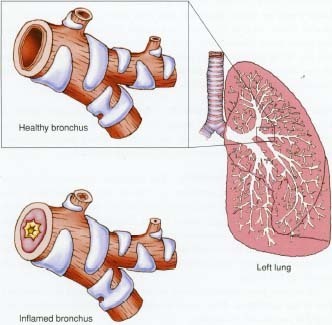 Bronchitis (brong-KI-tis) is an inflammation of the bronchial tubes, which connect the trachea (windpipe) to the lungs. Chrissy's father had been smoking cigarettes since he was Chrissy's age. In the last few years, though, her father had developed a nasty cough that never seemed to go away. Her father said it was just a "smoker's cough" and nothing to worry about, but Chrissy was concerned. Finally, she convinced her father to see a doctor. The doctor said that her father had chronic bronchitis, an illness that affects a large number of smokers. The doctor pointed out that too many smokers do not take this condition seriously until the lungs have been badly damaged. At that point, they can develop life-threatening breathing problems or heart failure. Surprised by what he had learned, Chrissy's father thanked his daughter for urging him to get help before it was too late. The next day, he joined a group for smokers who want to kick the habit. Bronchitis is an inflammation of the lining of the bronchial tubes. These tubes connect the trachea to the lungs. When the tubes become irritated or infected, they swell up inside. This interferes with the flow of air into and out of the lungs. The swollen and inflamed tissues also make large amounts of a thick, slippery substance called mucus * . People with bronchitis bring up mucus when they cough. There are two types of bronchitis: acute and chronic. Acute bronchitis comes on suddenly and usually clears up in a few days. Chronic bronchitis lasts for a long period of time, and it can come and go over several years. Acute bronchitis occurs when the bronchial tubes are infected by bacteria or viruses. Almost everyone has acute bronchitis at some point. * mucus (MU-kus) is a kind of body slime. It is thick and slippery, and it lines the inside of many parts of the body. These body linings are called mucous membranes. Close-up view of the anatomy of the left lung and of one of its bronchial tubes, which is called a bronchus. Healthy bronchi bring air in and out of the lungs, but people with irritated and inflamed bronchi have mucus clogging up the inside of the tubes. The inflammation interferes with breathing, and it causes coughing that often brings up the mucus. cause of this irritation, but such things as air pollution, dust, and fumes also can cause it. Once the bronchial tubes have been irritated for a while, the lining begins to thicken, and the tissues start to make excess mucus all the time. This leads to long-lasting problems with coughing and shortness of breath. The irritated bronchial tubes also are an ideal breeding ground for repeated infections. Over 14 million people in the United States have chronic bronchitis. Acute bronchitis can lead to chest discomfort, breathlessness, wheezing, and a deep cough that brings up yellow mucus. A person with acute bronchitis may feel tired for a few days and may have a fever. An occasional, brief attack of bronchitis usually goes away in a matter of days without causing long-term health problems. Chronic bronchitis is a more serious illness. The main symptom is a cough that produces lots of yellow mucus. The problem often begins with coughing that continues after a winter cold. As time goes on, the coughing may continue throughout the year. As the illness gets worse, the person may develop constant shortness of breath. To diagnose bronchitis, the doctor asks about symptoms and listens for abnormal breathing sounds with a stethoscope * . The doctor looks for other conditions that may cause coughing: asthma, an inhaled object such as a peanut, or a tumor. In some cases, the doctor may order other tests as well, such as a chest x-ray or a lung function test. But if the person's cough lasts for at least three months of the year, for two or more years in a row, then the doctor probably will diagnose the problem as chronic bronchitis. Time is often the best healer of acute bronchitis. To help the person feel better, the doctor may advise resting, drinking plenty of fluids, and perhaps taking nonprescription medication for fever and nonprescription cough medicine. The treatment of chronic bronchitis is aimed mainly at cutting down on irritation of the bronchial tubes. This means giving up smoking, avoiding polluted air, and staying away from irritants such as dust, fumes, and cold or dry air. People with chronic bronchitis also should try to avoid anyone with a cold or the flu, as catching such an infection can make the bronchitis worse. To make breathing easier, the doctor may prescribe medications that help relax and open up the air passages in the lungs. * stethoscope (STETH-o-skope) is a medical instrument used for listening for sounds produced in the chest, abdomen, and other areas of the body. Of course, prevention is always better than treatment of a problem after it has developed. Most cases of chronic bronchitis could be prevented if people did not smoke. American Lung Association, 1740 Broadway, New York, NY 10019. The American Lung Association posts information about chronic bronchitis at its website.